Reading time: about 8 minutes. Head of the design team, Tomonori Mogi, used a Paris-Dakar winning NXR750 as the basis of the design for the new commercial bike. With its design being heavily influenced by the NXR750 the commercial XRV650 was built to perform in a way that was true to its heritage. Its engine was a 647cc water-cooled 4-stroke 52° V-Twin SOHC with 6-valves, somewhat de-tuned by comparison with the race bike because Honda wanted to keep the hard-earned reputation of their bikes having bulletproof reliability. The engine produced 56hp. Transmission was 5-speed with chain drive, front suspension was by 43mm Showa forks with 230mm travel whilst at the rear was a Pro-Link mono-shock with 210mm travel. The front brake was a 296mm disc and at the rear a 240mm. Seat height was 880mm and the fuel tank was not the monster competition unit of the Paris-Dakar bike but provided an adequate capacity of 24 liters (6.34 US gallons). Dry weight of the XRV650 was 193kg (425.5lb). 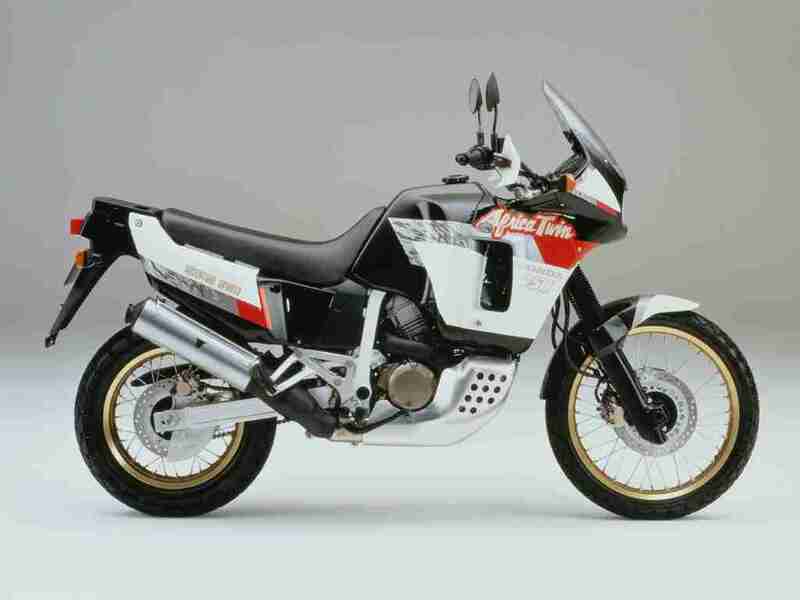 The successor to the XRV650 was the Honda Africa Twin XRV750 which made its debut in 1990. The engine of this new model was increased in capacity to 742cc but was otherwise the same 52° SOHC V-twin with six valves and dual spark plugs now producing 62hp at 7500rpm and 62Nm torque at 6000rpm. The clutch was the same multi-plate wet unit but the suspension and brakes were changed. The front brakes being twin 276mm discs with twin piston calipers and the rear a single 256mm diameter disc with a one piston caliper. Front suspension was by 43mm air assisted telescopic forks with 220mm travel whilst at the rear was a Pro-Link with pre-load and compression damping adjustment giving 214mm travel. Wheels were 21” front fitted with a 90/90 D21 tire and 140/80 R17 tire at the back. Fuel tank capacity was 24 liters (6.34 US gallons). Seat height was the same at 880mm. Dry weight was 209kg (460.8lb). 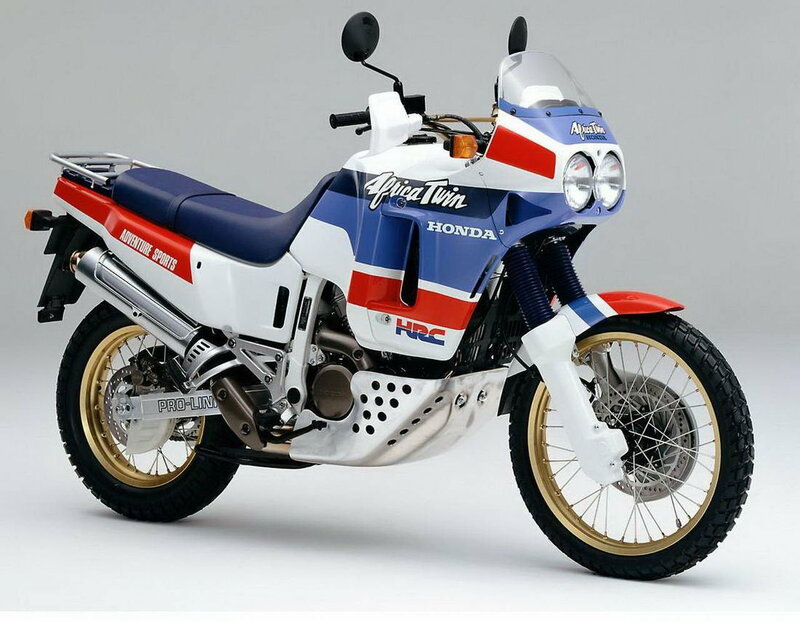 The last version of this bike was upgraded with a digital trip computer called the “Tripmaster” for 1992 models. 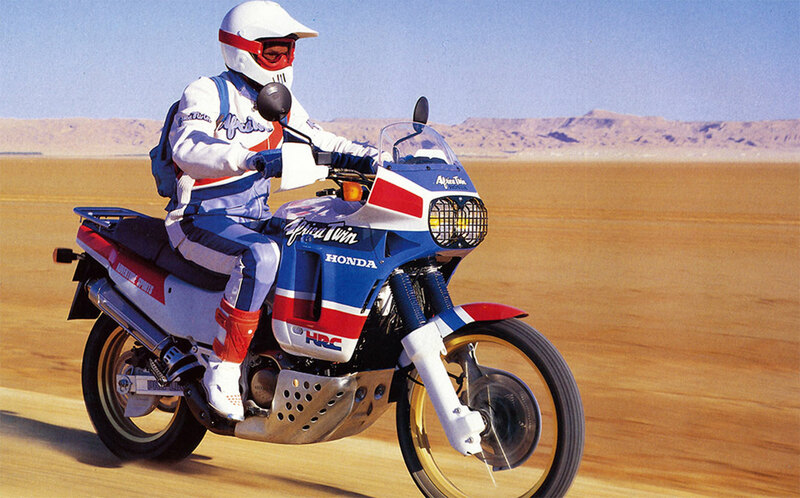 The “Tripmaster” was essentially a series of digital clocks made to look like a Paris-Dakar Road Book and it was from then on fitted to the later RD07 and RD07A models. The Tripmaster is something that is known to go faulty on older used bikes and owners often find it preferable to simply replace the dash unit with something more rugged and reliable – like something that has a built in power supply for satellite navigation and/or other accessories. The 1993 Africa Twin XRV750 was a thorough re-design of the bike with emphasis on lowering the center of gravity and with the additional benefit of lowering the seat height to 860mm. The re-design also slightly reduced the bike’s dry weight to 205kg (452lb). The new chassis and lower center of gravity produced significant improvements in the bike’s handling, improvements that were especially noticeable when maneuvering at low speeds in off road settings. The fairings around the bike were also re-designed in a way that kept the bike looking like the successor of the previous Africa Twin but more stylish. Although the engine capacity remained the same the engine power was lowered slightly to 59hp, but torque remained the same as the previous model. Fuel tank capacity was slightly reduced to 23 liters. All of the Africa Twin XRV750 variants are known for being docile and controllable, they’re also regarded as being largely bulletproof. 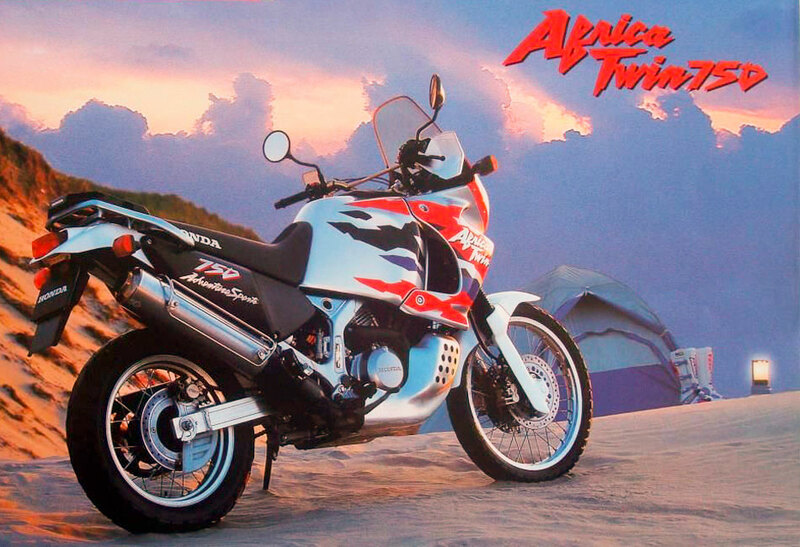 The Africa Twin XRV750 from 1996 until the end of production in 2003 was really a face-lifted version as the changes were mostly cosmetic. The seat was re-designed to improve rider comfort but in the process the seat height was increased to 870mm. With the ending of production of the XRV750 in 2003 there would be twelve long years before Honda would release a new “Africa Twin”, and that new bike would be a new creation very different to its predecessors. 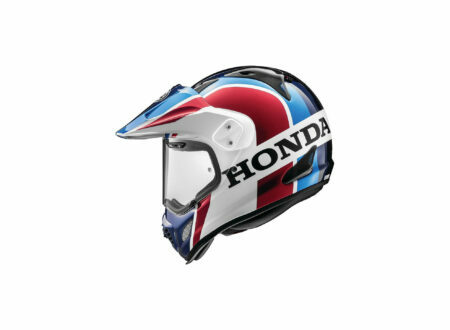 The Honda Africa Twin was born anew in 2015 as a new bike, and an “Everything old is new again” concept from the ground up. 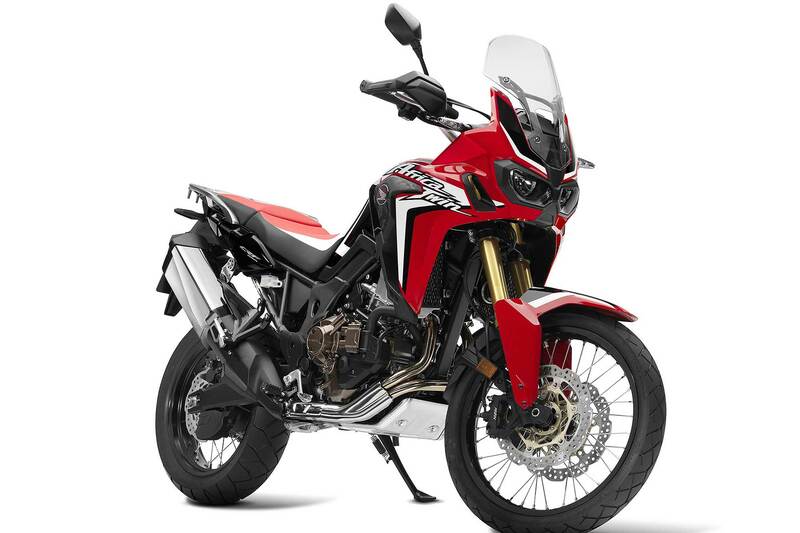 The new CRF1000L Africa Twin was created to be a competitor to the new generation of heavier long distance touring motorcycles such as BMW’s R1200GS, the Ducati Multistrada, and the Triumph Tiger Explorer, all of which are primarily built to be long distance highway and adventure motorcycling, not desert racing bikes; motorcycles for a Paris to Beijing journey rather than a Paris-Dakar Rally. 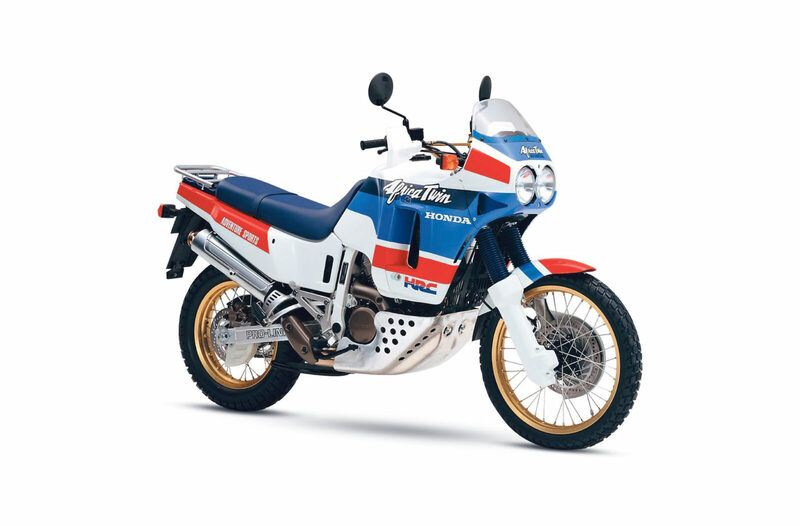 Although Honda decided to build a new Africa Twin that would compete with these big long range cruising bikes they also decided that their new Africa Twin would be lighter and more capable off road than their competitors and so they stuck with very similar dimensions and specifications to their old Africa Twin models. The wheelbase of the new Africa Twin CRF1000L is almost the same as the old XRV750 measuring 62” by comparison with the XRV750’s 61.6”. The engine however is completely different. Gone was the 52° V-twin to be replaced with a British-style parallel twin of 998cc capacity with 270º crank offset and putting out 94hp at 7500rpm, with 98Nm (72lb/ft) torque at 6000rpm. The parallel twin engine makes more sense simply because it is shorter which is helpful in keeping the bike’s length down. 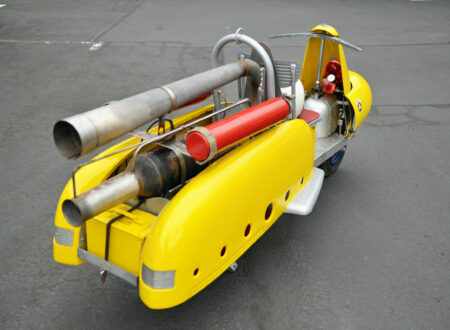 With the bigger engine the bike’s dry weight increased to 212kg (467.4lb). 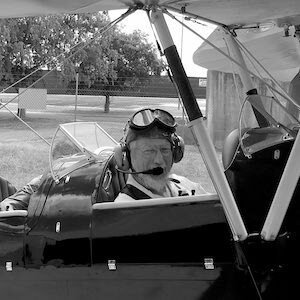 Despite the increased engine capacity the fuel tank size was reduced to 18.9 liters (5 US gallons). The engine is designed to deliver linear flat power and so it can feel like it has less than it really is able to deliver. The engine seems to enable the bike to grip and to push the bike forward making it easy and predictable with no distinct rev/power surge to beware of. Ground clearance on an off-road bike is mission critical and the CRF1000L has been given a generous 9.8” (250mm) much like its legendary predecessors. For this new model Honda provided two transmission options, a six speed manual gearbox which is smooth and fabulous to use, or their patented Dual Clutch Transmission (DCT) which provides an automatic transmission. For the CRF1000L the transmission was specifically developed to be suited to off road as well as on road use. The CRF1000L is built on a steel semi-double cradle frame with front suspension being Showa 45mm inverted forks with 9” (229mm) travel and a single Pro-Link shock at the rear with 8.7” (221mm) travel. Brakes are dual 310mm wave floating rotors at the front with Nissin four piston radial mount calipers, and a single 256mm wave rotor at the rear with single piston caliper, the system being fitted with with two channel ABS. 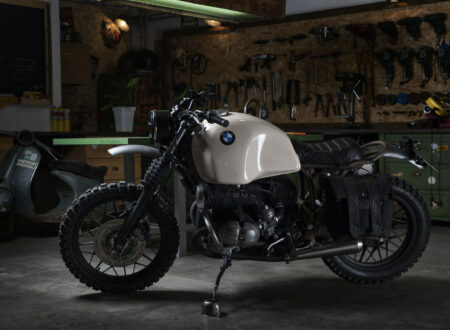 This means the ABS for the rear can be deactivated allowing the rider to intentionally lock the rear wheel for sharp turning a corner on the dirt without the front wheel locking and causing a nasty life experience. In addition to the two channel ABS the bike has three levels of traction control making it not only easy and comfortable for an experienced rider but making off road control and managing slippery surfaces such as snow and ice especially predictable for an inexperienced rider. One reviewer went so far as to say “Anybody can ride that bike cruising or fast.” The wheel size for the new CRF1000L is almost the same as on the older XRV750 models. The XRV750 were fitted with a 21” front and 17” rear alloy wheels with steel centers whilst the CRF1000L has 21” front and 18” rear alloy wheels also with steel centers. Tires for the CRF1000L are a 90/90-R21 tube type for the front and a 150/70-R18 tube type at the back. The instrument display for the CRF1000L is an all digital unit with speed and engine revs shown at the top and a lower section with more technical information such as engine temperature, fuel level, trip meter and fuel consumption. The lower section also displays warning lights for activation and level of traction control. All in all the new Africa Twin CRF1000L is a twenty first century motorcycle that is a worthy successor to its near legendary ancestors. It is very likely that it will become something of a legend in its own right. 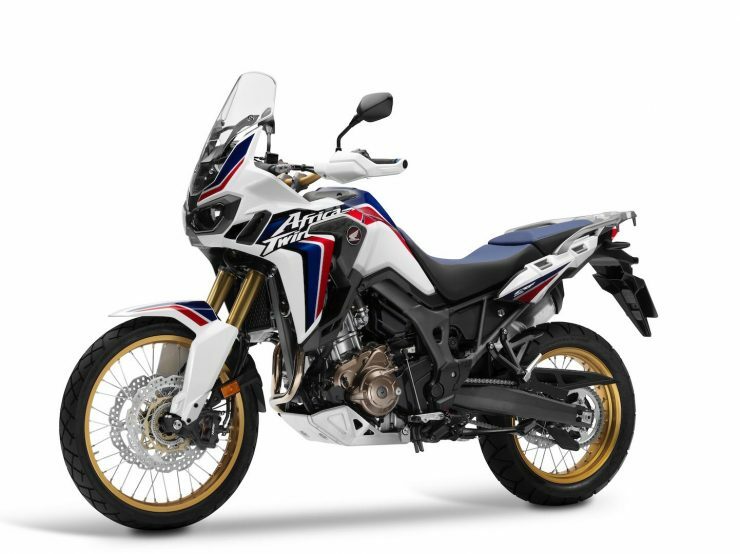 The various models of the Honda Africa Twin are some of the best choices if you’re looking for an adventure motorcycle that will carry you on a journey of a lifetime, or for a fun weekend’s fishing, or comfortably off to work on the daily commute each day. 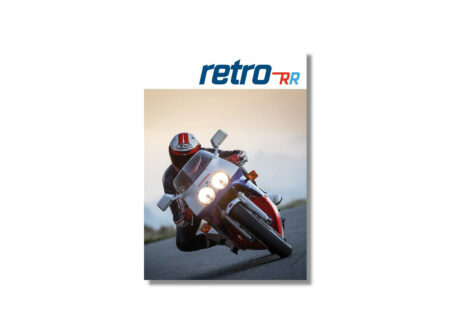 The older bikes will have some maintenance issues as one would expect simply because they are older but those who want a bike to tinker with and improve will enjoy those challenges. The new model is difficult to fault. It’s a big bike but it’s a bike that even a less experienced rider will be able to use and enjoy. It’s a motorcycle that’ll cross continents just as easily as it’ll cross town. Editor’s Note: If you have tips, suggestions, or hard earned experience that you’d like to add to this buying guide please send us a message. We’re always looking to add to our guides, and your advice could be very helpful to other enthusiasts, allowing them to make a better decision. 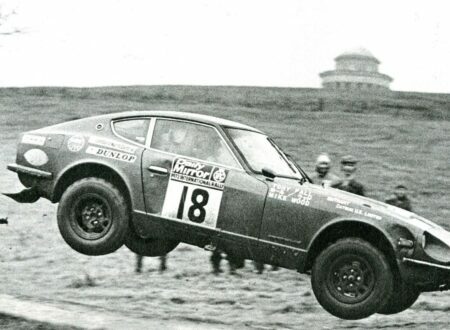 The story of the Datsun 240Z begins on the race track, and it dates back to 1964 when the Prince Motoring Club was established by Dr. Sakuri of Prince Motors in the wake of defeat by a privately entered Porsche in the Japanese Grand Prix of that year.